Nestled in the heart of the Ozarks, Branson West is a prime destination for those looking for beautiful natural scenery and an abundance of outdoor activities. Branson West, Missouri is ideally situated near breathtaking hiking trails and sparkling blue lakes, and it's just a hop, skip, and a jump away from the lively entertainment hub of Branson. So whether you are planning a romantic getaway with your significant other or are planning an adventure-packed trip for your whole family, you should definitely consider a trip to Branson West. When starting to plan your trip to this Ozarks gem, rely on Vacatia to help you sort through Branson West resorts so that you can find the perfect accommodation for your group. Vacatia helps travelers sift through vast selections of hotels and resorts so that they can easily find a vacation rental that suits their needs. So before you spend hours and hours researching accommodation in Branson West, use Vacatia to help you find one of the best resorts in Branson West for your trip. Branson West is a charming Missouri town that is surrounded by picturesque mountains and stunning lakes. Conveniently located near Branson, a vibrant town where there is always plenty to do and see, Branson West provides the perfect home base for your upcoming adventure in the Ozarks. If you want to experience the excitement of this charming vacation destination, let Vacatia help you find the best Branson West lodging available. Whether you are traveling with your family, your significant other, or a group of friends, you can rely on Vacatia to help you book one of the very best Branson West hotels for your trip. Vacatia offers vacation rentals that are much more than just a standard hotel - Vacatia's resort residences provide ample living space, such as extra living rooms and kitchens, as well as premium hotel services. You can have the best of both worlds during your trip to Branson West, Missouri, as long as you work with Vacatia to plan your upcoming vacation. Branson West is home to several quality resorts, and thanks to Vacatia you can find the perfect Branson West resort for your home base in the Ozarks. During your stay in Branson West, you can explore the endless mountains surrounding the town by hiking pristine trails that culminate in breathtaking views. You can also spend your time relaxing on Table Rock Lake, where there is an abundance of fishing and water activities to entertain you and your family all day long. When you want to experience some great live entertainment and dining, make your way into the charming town of Branson, which has earned the nickname the "Live Entertainment Capital of the World." There is no shortage of things to do and see in Branson, which is why you should start planning your trip to Branson West today with Vacatia. 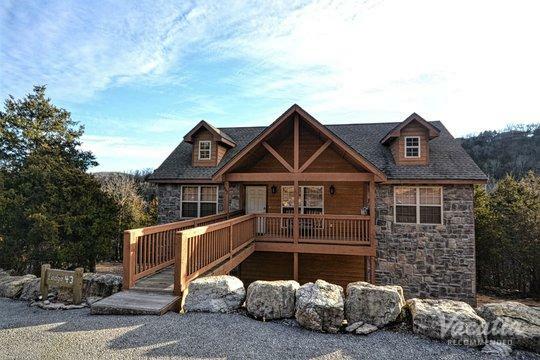 When you find a quality vacation rental through Vacatia, your comfortable rental is sure to become your home away from home during your time in Branson West.